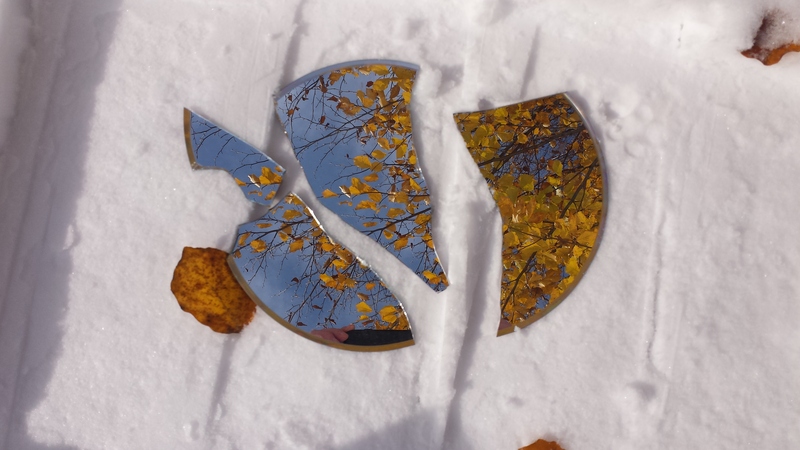 Sometimes, to teach a poem, you just have to go outside and shatter a mirror. For Cummings, shattered mirrors, and shattered language, are not unlucky. Far from it. More on this in a moment. Teaching a survey of American literature has its pros and cons, to be sure. In order to provide a survey of the literature from 1865-1945, one ends up spending only a day on T.S. Eliot—and maybe only half-a-day on Gertrude Stein—in order to allow the space and time for novels and short stories (and perhaps one play). Most modernist writers are difficult, and even the “more accessible” writers like Robert Frost have their own “vast chaos” that ought to be explored (12). It is beyond challenging to do justice to the difficult poetry and poetics throughout modernism, and EEC is no different. Unfortunately, Cummings often gets pushed aside. Anthologies may include only one (or two) of his more avant-garde pieces because of their strangeness, their difficulty, and the sense of WTF do we do with that? The Norton anthology I use includes only some of his “more accessible” experiments like “Buffalo Bill’s” which is a marvelous poem, but it does not quite demonstrate the way that Cummings brings to fruition the modernist principle of fragmentation. The selection of poems in an anthology often do not give students a chance to venture into Cummings’ difficult poetics, and as a result, his work is often overlooked or dismissed. This year, I decided to end our unit of Modernist poets with Cummings. As we explored Stein, Eliot, Williams, Stevens, I intentionally foregrounded their statements about what modern poetry is all about—especially the statements that had to do with words breaking apart (Eliot), and the poem being a new stage (Stevens), and the need to undergo a complete recasting of poetic structure (Williams) and so forth (for details and citations, see EEC—A Major Modernist Poet?). And then, in the last ten minutes of the class before our day on Cummings, we went outside and shattered a mirror. I placed a mirror in a box, and then placed a rock over it. For safety, we taped the box shut. This way, no one gets injured and no one sees their face in the mirror the moment that it shatters. I suggest to students that it is only unlucky to break a mirror if you actually see your face in the mirror the moment it breaks, because then you see your reflection shatter, and that could give you bad luck for seven years. Outside, a brave volunteer, who vows not to sue me if she gets bad luck anyway, picks the box up and drops it. Then we open it up, and see each fragment, and read “pieces(in darker” (CP 623). Here, Cummings wonders why people think it is “un / lucky” to shatter a mirror, for each piece, each fragment, is “whole with sky” (CP 623). I encourage students, then, as they read Cummings’ more difficult poems, to pay attention to the ways that the fragments are whole with their own poem, so to speak. To use Etienne Terblanche’s phrase, each fragment becomes its own “micro-ideogram” (Terblanche 73)—full of a wild semiosis. William Blake’s “Hold Infinity in the palm of your hand” helps draw out the implications of Cummings’ use of fragmentation. The fragments become their own “sky” full of infinite potential. Instead of having “one sky,” we now, through the fragments, have multiple skies and multiple infinities. How? The fragments often generate several semiotic possibilities not only through connotations but also through their material gestures on the page. I assure students that I know they can “get” the metaphor of “shattered language” and “shattered mirror” without going outside and seeing it in action, but there is something existential and phenomenological about actually experiencing the metaphor. Seeing the sky reflected in several fragments is uncanny and refreshing. The exercise not only gives students traction as they venture into the difficult world of EEC, but it also serves to bring our discussion of fragmentation in Modernist poetry to full fruition. It shows that EEC is not an anomaly, or a break, from modernism, but much the opposite. He is the one who brings the principle of fragmentation to fullest fruition. Frost, Robert. “The Figure a Poem Makes.” Twentieth-Century American Poetics: Poets on the Art of Poetry. Ed. Dana Gioia, Meg Schoerke, and David Mason. Boston: McGraw-Hill, 2004. 11–12. Print. Terblanche, Etienne. E. E. Cummings: Poetry and Ecology. Amsterdam: Rodopi, 2012. Print.